There’s a lot of envelope choices out there. It can be overwhelming to choose one, or difficult to find the right one. Make it easier by getting an envelope that has a versatile quality and comes in a large assortment of sizes. Earth Brown Translucent Envelopes can be mixed and matched with different prints and colors to create your ideal invitation or announcement. Vintage inspired / rustic wedding invites also coordinate well with Earth Brown Translucent Envelopes. 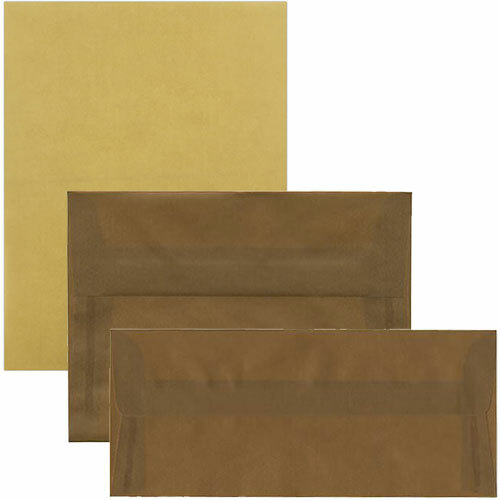 Earth Brown Translucent Envelopes are made from natural vellum paper, which is made from pure cellulose fibers. They’re recyclable and acid free, so they truly are an “earth” envelope. Matching 8 ½ x 11 Earth Brown Translucent 43lb Cover, and 12 ½ x 18 Earth Brown Translucent 43lb Cover is available.